Everything looks to be in order with this application! The backstory is to the point and covers the Pact war's impact on Vanessa's family, so you should be good to go! As a forewarning, however, the character will not start out with their family home in Barkamsted; be it lost to property management or otherwise, no land or home will be under their name. With that in mind, welcome to Saphriel! -Do you have any prior roleplay-related experience? Well, I've been on several Minecraft roleplay servers in the past such as LOTC, Thronecraft, Alaurin, Fallout The Last Frontier and Aenasan. I've also participated in a few fantasy forum rps and Discord rps as well. Powergaming is forcing actions against another player ranging from casual roleplay to that of intense combat roleplay in which a player might emote impaling their opponent on the steel blade of their massive greatsword in a single emote. Using knowledge that you've gathered through OOC means and applying it in an IC in which your character would of not have such knowledge. -Character age: Not exactly known however, it can be assumed from his general appearance that he is between 18-20 years of age. -Character description: Duncan has the appearance of a youthful young human male that has just recently reached adulthood. His hair is a nice shade of light brown and is grown out in such a way that the ends of it reach down to his lower neck. Duncan's face lacks facial hair due to regularly shaving every now and again. His skin is also quite fair with a slight tan due to long hours in the sun's rays. His attire consists of a simple jerkin over a long-sleeved wool shirt, with dark brown trousers and black boots. -Character personality and traits: Duncan is a rather simple man even in his youth, with a currently optimistic outlook on life. He's become rather hardworking and honest due to many years of manual labor as a simple farmer. However, even in his youth, Duncan has proven himself to be incredibly stubborn and rather disliking of immediate change. His most defining strength is how headstrong the young man is, while his greatest weakness being his general inexperience in most fields. Overall Duncan is a well-balanced individual who like most folks only wishes for a happier existence. At first glance, one would look to Duncan and see just a simple commoner of little importance or wealth. However, would many do not know is that life had not always been this way for the young man. In the later days of the Pact war, a family of rich merchants was given a new addition to their family in the form of a baby boy who they would name, Duncan. For five years Duncan had lived amongst his family's personal estate amongst the rolling hills of the nearby countryside. Duncan was never lonely, finding friends in both the Family servants and his fellow brothers and sister who he had plenty of. However, fate had different plans for Duncan's family when a large Pact raiding party of Orcs and Goblins had besieged the estate. Eldin Forrester, Duncan's grandfather and patriarch of his family had rallied the rest of the estate guard and his own personal men at arms and attempted to counter the raiding party. Yet this final defense ended with Breckenridge and his men being cut down and the estate being set aflame. Having nowhere else to go and having heard of the city's taking in of refugees. Duncan's family made their way to the city of Barkamsted with only the clothes on their backs and the little wealth they still had in their purses. Even in the current day, Duncan remembers very little of the family's pilgrimage to Barkamsted and only truly remembers looking upon the city's gates as a small child. From there his family had begun a new life as simple farmers who every once in a while reminisced about the lives they once had. Duncan had found great success as a farmer and had spent most of his time with his father and older brothers in the fields. As the years went by some of Duncan's brothers and sisters had come of age and "spread their wings". Duncan's oldest brother, Tommen had begun a stonemason who earned himself quite a living. While Kaija, Duncan's youngest sister had fallen in love with a roaming bard and had started a family of her own not too far from her family's farmstead. Duncan soon found that he himself was beginning to near adulthood with each passing day and was uncertain as to where he wished to go in life. While farming had been quite the learning experience for Duncan, he wished for something greater in his life and had spoken to both his father and mother, who had now been nearing fifty years of age respectively. They knew that their son had inherited the "Forrester's lust" which they jokingly stated must have been inherited from his now long deceased grandfather. The next day after a heartmelting farewell, Duncan had packed up a few days worth of food and set off on his own, with a new sense of freedom and lust for adventure. Answer: I curse under my breath as I watch the child take off with my hard-earned coin. I try to give chase however with how crowded the marketplace was I quickly lose the child and silently pray that the child uses his coin for benevolent means. Answer: I look upon the small family of wolves, and carefully make my way forward. I make sure as to not do anything that could be seen as threatening to the wolf mother. I would then try to free the mother from the trap and take my leave with my eyes watching the mother in case she tries to attack. I pray for the mother's recovery and the good health of her pups. Everything looks organized and well, and you should be good to go with your new character. Welcome to Saphriel! -Do you have any prior roleplay-related experience, if so could you give an example? : I used to use feralfront.com extensively, so much so that I had been an active member of it for years before it even transitioned to feralfront.com (it was previously known as wcrpg.com). I also used to roleplay a lot via Kik (super shady I know). When I was but a wee poppet, I roleplayed on Animal Jam. I never said my beginnings weren't cringey. -Define Power-gaming in your own words: Powerplaying is when your character is practically god. You can do everything, dodge anything, and kill whatever your heart desires in one hit. Actually no, scratch that, in a simple bat of an eyelash. Powerplaying is no bueno. -Define Meta-gaming in your own words: Metagaming is equally no bueno. A person who metagames takes knowledge learned OOC and their character magically knows in IC. I.E., a town is planning to revolt against the city is revealed in OOC, and the character suddenly knows about it and tells the city leader and they smash that revolt, when they never should have known of it in the first place. -Define Role-Playing in your own words: The act of placing oneself into another person's shoes. Metaphorically. This can take you to a new world, a new dimension, a new entire race. But it simulates real life, or the "real life" parameters set by whatever's shoes you've went into. -Character age: A nice old 27. -Character Occupation (optional, note you still must talk to the lord about loaning or purchasing any stall/shop for your character if he/she would have one. This more or less helps us to better understand your characters starting skill set): A mystical alchemist with an affinity for animals. -Character description (At least one to two paragraphs describing your character’s visual appearance. ): Illium is a very, very pale elf, a bit on the shorter side with a height of 6'5 and a half" due to her semi-mixed blood (looks like short's a dominant trait ;u; ). Her hair is equally fair, a light, fawn brown with sparse blonde highlights. Her pasty complexion leads to her cheeks and nose, along with hands, feet and knees, to have noticeably pink hues, which is much more prominent in the colder seasons. Her eyes are the color of river water, and she accentuates that with a snowy blue shirt, lined with black trim and soft, white fluffy balls of cotton dangling from it in places. She wears black shorts with tattered edges, and adorning her ankles and head is the same black, cotton-bedazzled material. -Character personality and traits (At least one to two paragraphs describing their personality traits and/or quirks. ): Illium is very much a pacifist and loves all things nature. -Do you have any prior roleplay-related experience, if so could you give an example? : I've been roleplaying for acouple years now, most of my time was spent on other servers(Thronecraft, Mirrasil, Rise of Kings, Etc), and also doing some tabletops like DnD. -Define Power-gaming in your own words: Power-gaming is the act of forcing a player to conform to an emote that you've laid out to them without giving a chance to react, this can be something simple, or complex. Like combat, walking, etc. -Define Meta-gaming in your own words: Metagaming is the act of using information you have gained through OOC means to do something your character wouldn't do, or knowing something your character has not properly learned through IC means. -Define Role-Playing in your own words: Roleplaying is the act of creating a simple character, with simple goals, inspirations, and upbringings. Playing them out to see where you can lead said character. Kaiden currently does not have an 'Occupation', but his trade is being a blacksmith. -Character description: Kaiden looks to be more aged that he actually is, looking to be around his mid-twenties though only having just reached adulthood in many peoples eyes. At first glance, Kaiden is just like any other human, though, with a closer look one would see a man with Pale-Green eyes with pale-like skin that compliments such. While a shorter man at stature, some is present muscle through his clothing due to years at working the forge. -Character personality and traits: Through time spent with the young man, people would be able to pick up notes on slightly cynical behavior, not to say that he believes every person out for themselves, but a general lack of confidence in intelligent society, thinking that it is only a matter of time for it to be torn all apart for one reason or another. Besides this, others might be attracted to his calm and well-spoken demeanor- Never being one to yell or curse in anger unless the situation is dire or calls for such a thing. On top of this, he is rather confident, trusting his abilities above all else and believing that as long as he sticks to them, nothing could truly go wrong. Kaiden had lived a relatively simple and peaceful life for the first years of his life, being born on a smithy and the village it was held within along with two other brothers. Quickly, he took up his forefathers trade. Often serving as his father's apprentice, like all of his family- Kaiden has never been interested in, nor had the option of getting a proper education above that of a well-off commoner family. When he reached the age of 9 is when his family was forced to seek shelter from the war that had ravaged the realm for years. Eventually, the pilgrimage to Barkamsted would come to an end- And a start of a new and tougher life for the small family of five would come ashore. Years of hard labor and earning just over enough to get food on the table, if not for him and his father’s profession, they would had surely starved. Then the time came for the counter attack, his father- Determined much like the rest the alliance, volunteered- With his two eldest brothers at his side. Sadly for Kaiden and his mother, that would be the last time they would hear of their valued family- Never receiving word of their most certain demise. Still young, but having the knowledge of his forefather- He was able to earn Apprenticeship of a dwarf blacksmith, growing a new found respect for the race through his work and with his mothers eventual passing- He gained a passion for his trade. Finally, when peace was finally among the realm- And it was safe to pursue a life outside of the walls of Barkamsted, Kaiden did so- Doing nothing of note on his travels. Being used to this village, and the trends of the market place- Kaiden quickly caught the small and wannabe child thief that had taken his coin pouch just the other week- And had the courage to do it once more! With a calm but demanding voice, the man said; "The coin purse, now. Before I change my mind and decide to throw you to the guards." The poor girl- Scared out of her mind did not think twice to hand back the items stolen from Kaiden. Though, seeing the child in their rags pulled a string in Kaiden he wished he did not have, with a long sigh- He placed two coins in the hand of the girl- Perhaps it was an act that he had fell for, his thoughts said- But, he continued on his travels. Kaiden frowned as he beheld the sight, recognizing the situation he was in quite fast- Without any hesitation, The young man walked to the ignored wolf trapped. Muttering a short prayer he had heard his mother say many times in a tough situation, he drew a dagger from his belt- Quickly putting the wolf, and the pups out of their miseries. He found no joy in doing so, but the fact of the matter was- The mother would die with his help, without the mother, the pups would die. It was much better to spare the trouble of doing so. And in the process making profit and saving local farmers from the hassle of doing it themselves. Please finish an application before posting! Once or if ready to apply fully, another review will follow. Most of this application is in order, but there are a few things to work on in your character's backstory! To start, please add more in regards to the Pact War and its impact on Kaiden's family, as currently, it feels more like a note slid in. Mind that the Pact War had absolutely ravaged the entirety of the known world for nearly a full century, resulting in all of the Alliance races packed into the peninsula that was Barkamsted. This should be shown more in the backstory! Furthermore, there are not too many nobles with any reasonable inclination to hire Humans when their own kind would do better by them, in most cases. All Human noble families were wiped out in the war, leaving only the Elven families who would primarily focus on tending to their citizens, the High-Elves. Should you wish to keep working on this path for your character's backstory, there will have to be a much greater reason behind why they would be patrons of a noble. Should edits be worked up, another review will follow shortly! Sorry for that, It's edited up and I hope I got it right this time around! Thank you for your edits, and welcome to Saphriel! However, I will have to note one minor issue in the timeline of this application. By the time Kaiden would be 9, Barkamsted would already have become the only safe bastion of man for two years; reasonably, any family would see it fit to depart then or before then. So long you are fine with adjusting the character's age to have left at the age of 7 or 6, everything else looks clean and good to go! -Do you have any prior roleplay-related experience, if so could you give an example? Yes, I played on a few servers. My first one being Drakeheart back in 2015 that fell due to time but it really got me into the door of roleplaying. Had to take a break due to schooling but I always had a desire to return to the world of roleplaying. -Define Power-gaming in your own words: Power-gaming is like doing the impossible or being perfect at everything in a fight, such as always dodging or going for a killing blow without letting someone else react to it. -Define Meta-gaming in your own words: Knowing certain thing that your character wouldn't even know like plot events or information you’d get from Out Of Character. -Character description (At least one to two paragraphs describing your character’s visual appearance. ): Julius is approximately 5’9 tall with light brown, short hair. His body is rather slim, skin being white, and has blue eyes. His wardrobe consists of a wool red undershirt with a brown leather vest over it. He wears tan colored pants that reach to inside his brown buckled shoes. To complement his shoe and vest color, he wears brown leather gloves. On his waist, he wears a black belt, attached to it are two brown scabbards, one on each side of his hips. -Character personality and traits: On the surface, Julius is a very charismatic yet snarky individual who will often make quips and will regularly express his opinions this making him very talkative and possibly warm nature to some, showing kindness albeit being a bit passive aggressive at times. He is often making some sort of joke and is very physical, often wrapping his arms around people with a drink in his hand getting very chummy and laughing with everyone even if their joke wasn’t that funny. In the midst of battle; mainly sparing, he will often taunt his opponents mid-battle to get under their skin to distract. He won’t hesitate to fight dirty if he needs to, often doing whatever it takes to yield the best result for him. Despite his fighting style, he can act kind and will generally be supportive. Although, not for the right reasons. Underneath he is a very greedy and power hungry individual, often thinking of himself first and always wondering how to progress himself in his life. He is power hungry, mainly wishing for massive wealth that he could control people from behind the scenes. He doesn’t look for friends but more so pawns that are willing to follow his ideals and act upon them. So to get more allies, he usually tries to uphold and accomplishes all the deals he’s made. This is also why he arrays a more friendly and charismatic aura in order to have more allies, figuring if he does something for them, he’ll get something in return like loyalty or monetary gain. He can be easily persuaded with large sums of money, considering money equals power in his eyes and is willing to burn bridges with people depending on the price. If he’s able to get away with it, he’ll switch sides midway depending on the price. Julius was born with only his mother by his side, his father dying during the Pact War. So from the start, he has to learn how to be responsible and multitask real quickly. He was well-liked by both kids and adults alike, always seeming to be a ray of hope for the new generation from his optimism and general curiosity of the world. He would always try his best to help out everyone he could. With his father’s death, he would try to cling onto any fatherly figure he could. That being Alark Tineas, A jaded, crooked mercenary who would frequently rest in the village after finishing his work. He wouldn't stay long, but it was a home to him. This interested Julius, always following him every time he returned, being captivated by the outside worlds and the adventures Alark went on. After getting to know the child, He latched onto Julius’s helpful and kind nature, manipulating the child to help in acts of thievery amongst the village. He would often put fabricated thoughts in his head, explaining how everyone is inferior to Julius. He would give non stop praise only when it benefited Alark, and shunned him heavily if he tried to refute anything he told him. But Julius still latched onto him, even got to the point where he’d spend all his time with Alark while he remained at the village. His mother eventually tried to forbid him from seeing Alark but he defied those wishes and in the night, snuck out of the house to continue talking with Alark. Alark decided to give Julius a nightly stroll outside of the village and continued to praise him for defying his mother’s wishes, putting thoughts in Julius' head, explaining how manipulative they really were. Even asking him if he would like to join in his adventures as an apprentice of sorts. Julius didn't really know what to think about the offer, They talked for most of the night, Alark trying to urge the kid to his side. Eventually, they decided to go back before morning hit and on their return, they saw the horror of the entire village being pillaged and burnt to the ground. They walked around the still burning village. Bodies littered the ground, some still moaning in agony. It was so recent that the perpetrators wouldn’t be far and could return at any moment, likely soldiers from the Pact War or some desperate barbarians. Julius begged to run by his house to find his mother, but Alark refused only filling more lies about how they ultimately deserved it and how they needed to escape. Julius, scared, traumatized, begrudgingly agreed with Alark and they both ran off to the night. That night, Julius learned the true horrors of how the world, how it could take away everything just because people wanted it to. He was only seven at this time. He questioned why this happened, could this happened to his father? Was his mother okay? He questioned to Alark if they would ever return. Alark only pushed him down and told him "Stop wondering about this damn village! Be generous that I'm even taking you with me and not leaving you for dead! Now move!" Julius shocked, didn't question his new mentor till he got much older. Years had passed after that day, The Pact War had finally ended, but life went on even during the war. Alark raising Julius as his own son, during that time he infected Julius with his own jaded beliefs. Without knowing any better, Julius followed thoroughly, without questioning his adoptive father, only seeing him as someone that could only do good. Alark continued his mercenary job, Julius joined with him in the process, but when Julius got a better understanding of what Alark was doing, is when Julius started to question many things Alark believed in. They would primarily take Shady jobs as it tended to yield more pay for them to survive off on, but Alark didn't mind, even enjoying the type of jobs even if it didn't yield as big of pay. This questioned Julius, if someone was truly good why would they enjoy taking these shady undertakings? Yet, as Julius grew older, he didn't mind, in fact, he took advantage of the situations. He eventually started negotiating himself in order to get better deals and pay for what they would be doing; Often twisting and using loopholes to his advantages, blackmailing, etc. Alark would keep the pay for himself however, only ever spending money of Julius when it came to basic necessities or training equipment. Throughout the years Julius became more distant to Alark and always observed every slip-up or boneheaded mistake Alark would make. Julius started to grow frustrated on how rash Alark acted, he saw this as a weakness, so he got bolder, questioning him, demanding to get paid for risking his neck to help Alark out. He would refute Julius’s arguments, simply telling him “Life ain’t fair”. At the age of twenty-two, It all came to a tipping point where the two were asked for an assassination assignment. Julius explained to Alark that he should get the entire payment due to his lifetime of servitude to Alark. He just scoffed and informed him that Julius needs to be more grateful, without Alark, he’d be dead. Julius simply smiled at his mentor before continuing to complete the job. It was twilight, they arrived at a small farmhouse. They both snuck inside the household, readying their weapons to strike. Julius however, snuck back into the shadows, leaving Alark by himself. He snuck back outside, only to find a pitchfork. He grabbed it with a smile on his face, suddenly he heard glass breaking and sounds of a scuffle broke out, and then silence. Julius snuck back inside the house and peered around the corner to see Alark over a dead body. Julius walked up calmly to Alark and congratulated him. Alark glared at him, his eyes blazing like an inferno. He was furious and demanded to know why Julius ditched him. Julius told him he found this pitchfork, and as he was explaining, mid-sentence he lunged and stabbed right in the chest. Alark’s eyes turned from a blaze to a dim light, Alark fell into Julius' arms. He gave a light smile and his dying mentor, quickly explaining that this would have never happened if he split the pay; even thanking him for raising him. He then dropped him from his arms and admired the loud thud when he hit the floorboard. He then spent the rest of the night trying to frame as the victim killed the assassin in self-defense, but ultimately died due to the wounds that were inflicted. As Julius existed the house, he was working out every last detail to convince his employers about what “truly” happened. Julius glares at the kid before chasing him down, he goes to grab the child (If this was a regular player, I will presume they allow me to grab them and not dodge out of the way) Julius quickly shifted his head to see if anyone was watching before dragging him into a back alley. Throwing him to the ground, he proceeded to stomp on the child’s leg so the child wouldn’t try to run. “Hey-” Julius begins in an angered tone before quickly shifting his voice to a more calm and joking way. He crouches down to get more of a friendly aura whilst his foot was still pinning the child. “Kid, you seem to something that belongs to me I would really like it back.” Julius extends the palm of his hand, using his fingers to gesture for the money. After the kid begrudgingly hands back the coin purse, Julius rests his hand on the child's head, patting it. He removed his leg and sat down fully next to the child, arms wrapped around the desperate child “If you wanted money from me, you could have just asked.” Julius then let out a chuckle and shook his head, “Okay, that’s a lie,” He looked at the entrance of the alley notices an elf walking past with finely dressed clothes looking more expensive than the usual robes citizens usually wear. A smirk snuck on his face before turning to the child But I’ll tell you what.” He points to a person with fine clothing walking away and leaving the field of view “You go do your magic trick with that guy, and we’ll split it evenly I’ll wait for you here and don’t think about running off with the money by yourself, because if you do… well, some associates of mine are always looking for cheap labor” He snarks before lifting himself up and watched as the child nodded before running off. He rested his hand on the handle of his sword, more so a contingency plan if the child mucks up this thieving like last time. Turning the serial thief pays some good coin. Bump so I know if I need to fix stuff or ney. Everything looks good, save for a minor issue in the timeline and beginning of your backstory! To start, there's a notable issue in the timeline of your character's backstory. By the time Julius would have been eight and had his village destroyed, it would have already been a year and some since Barkamsted had become the last safe bastion of the Alliance races; there would likely have been no village there, so please either adjust the time or work around this if you have any other ideas! Furthermore, the Knight's Order would not have been an association during the time of the Pact War, having been collapsed and brought to slaughter quite early one into the Pact War with the fall of the capital, Falkvard. Any knights or squires who may have survived the fall of Falkvard would have furthermore died of old age by this point, the capital having fallen 79 years ago. Once edits are made, please mention and another review will follow! Gotcha, changed Alark to be just a shady Mercenary, also aged up Julius to 26, even de-aging him to 7 when he left the village. If there is still a big issue I'll prob just change the beginning of his backstory entirely. While you probably still need to read the whole thing again, I did bold everything I changed to make it easier on you! Thank you for your edits, everything should be good to go now that issues have been addressed! Welcome to Saphriel, and enjoy your stay! Yes. While not in the Minecraft scheme of things, I did roleplay for a couple of years playing Elite: Dangerous, mostly on their gaming forums, but, tbh it wasn't really my style. People there were so rude at times, and quite nitpicky... I hope it'll be a better here! To find something new that gives a slight advantage over other players, and adjusting your own play style to accommodate it's value. An example of this, would be the recent update in CS:GO, where once the AUG and SG, two once very expensive scoped rifles (and disliked for its similarity to CoD guns), were made meta when Valve decided to greatly reduce the cost of purchasing them before rounds started in the game. Where once no one would use the weapons, Everyone started using them. Ranger. (Lord's Scout - retired) Has a strong knowledge of survival skills, a decent understanding of farming, is well acquainted with the bow and dagger's. Likes to cook delicious food as a hobby, picking herbs fresh from the forests surrounding his hidden home. Vitu'i Ma is a tall (6ft 2), olive skinned male, with a bald head, and eyes so dark one would mistake them for black. Having been born on a farm, and spending years in the wilderness, he's become quite accustomed to the many dangers that lurk out in the wood lands, and has become a fairly capable traveler, and has grown well muscled over his lifetime. While he identifies as human, he is in reality a half elf, on his mother's side. However, he does not know this, though he has his suspicions, for despite being 88, he only as the appearance of an middle-aged man, and moves swift, calculated, and well-purposed. His mother, knowing the racial discriminations that would impact him, chose to keep that little bit of knowledge secret. Is definitely on the quite type. Vitu'i likes to read and write, though his comprehension of "magic" is a bit misconstrued.. Alchemy on the other hand, being much more straight-forward and scientific, is something that he has a much easier time with. He likes riding horseback across the plains of the land from town to town, bringing in valuable supplies and meats and leathers and even the rare pastry that his mother had taught him how to make when he was young. While some may be brought to temper quickly, Luscinia is like a mountain. Steadfast, unmovable, and tranquil. Trust is earned slowly, and forgiveness even more so. Vitu's coming is as gentle as a summer wind, subtle, yet cool, familiar, and relieving. And while he may be scarred both mentally and physically from battles in the lands and once in the king's guard as a scout, the twinkling in his dark eyes shows the exuberant life that still flows within him. He never carries anything heavy, resorting to only using a very sharp dagger, his bow, maybe a few potions, and in extremely rare times, his sword. The only armor he ever wears is reinforced leather. Ironically, Vitu'i Ma does not speak any other language fluently, but he has read and met enough people to be able to pick up on a few specific words. To be frank though, by watching a person's body language, he can piece together another's message pretty thoroughly. Born in the year -02, Vitu's peaceful farmlife was quickly thrust into the events surrounding the Pact War, when his homeland of Havrith was overtaken. It was after his family was caught and killed, at the age at the young age of 17, he enlisted as a scout for the Lord Barkham. While he did not do anything particularly notable, he was involved in several skirmishes and learned the basics of espionage and sword fighting. Using the bow came later, when he was 19 on one such skirmish, a stray blow to Luscinia's clavicle, crushed the tendons connecting his shoulder to his arm, rendering it useless in the fight. He never fully healed and his arm never felt the same strength that was required to continuously swing a sword. As the years raged on, he aged slowly, never knowing the elven blood inside of him preserving his tireless stature. Not that anybody really lived long enough comment on it. Being a successful scout, he found himself being ordered to dive deeper and deeper into enemy territory, with each incursion lessening his small band of brothers with each passing year. It became so bad, that in one month, Vitu changed regiments five times. He barely had time to remember his comrades names before they were killed. On the reclamation of Havrith, and being over 40 years old, Vitu retired from the Lord's enlistment, and took the solemn vow to never again allow for such evils to spread throughout the land. For the next forty years, he would silently serve the land by living the life of a Ranger, preserving the good and forbidding the many evils of the world to come back to his homelands of Havrith. Vitu'i chased after the dirty, disheveled boy, until he cornered him into an alley-way. The boy turned around, white knuckles clenching the coin purse, as he gazed upon the looming man he had thought would be so easy to steal from. "You took my money. Give it back." The man growled, a hand holding onto the still-sheathed sword. The boy cowered and threw the coin purse back, and Vitu easily snatched it out of the air. He thought for a moment. "Why did you steal from me? Did you think I was rich? Easy to steal from? Did you not think someone like me couldn't around a scrawny thing like you? Do you even have a weapon?" Vitu'i thumbed his sword's hilt, letting it slide out an inch. The sunlight cascading into the alley way from above caught the edge of the blade. The now sweating boy gulped and shook his head. "N-no sir, it’s just that I was, I, I was just hungry mister.. I wan-wanted your money for some food.."
Vitu'i Ma shook his head and stepped toward the boy, making sure his thunderous steps echoed throughout the narrow spacing. Before the child, he knelt, and pulled out a pastry that his mother had taught him how to make, decades prior, and held it out to the small child. The boy cautiously took the roll out of the man's hand, and looked up into the grieved face with wonder. Vitu stood and pulled out a tiny dagger, which he flipped and caught it by the tip of the blade. The boy tentatively took the dagger, and watched astounded, as the man walked away. Vitu ponders the situation before him. Then he reach for his pouch, and bent over, dripping some sleeping medication into the wolf's frothing mouth. Having spent many of his years hunting the lands, he had come across any assortment of traps and mechanizations designed to ensnare, maim, and kill creatures ranging from all sizes, it was no problem for Luscinia to quickly disable the trap's mechanism. While the wolf mother would certainly have difficulty for the next few months, Vitu wasn't worried. Animals that caught his scent had a strange habit of following him to his home. It didn't really matter what animal it was, they all treated him the same. With mutual respect, as if he were an old friend to them. He was certain that the wolf mother would rise and follow his smell back to his home, where she could hunt and recover her stamina in safety. Luscinia is someone who has struggled trying to ascertain any magical talents. Despite him having a quarter of elven blood, and reading tons of enchantment books, magic has never shown him the path to enlightenment. He dreams of the ability to bring lightning thundering down, or to wrap his bow in a mystical aura of blue power... But to be honest, he'd really be happy just to light a fire by snapping his fingers together... It'd certainly help speed things up when he needed to cook himself some food when he was finished hunting for a day. Vitu'i has seen others perform magic, and likes to think that he could mimic the movements, the words spoken, the mental involvements neccessary. Luscinia has seen plenty, and has fought plenty more, but what if something unspoken comes his way...? Something that cannot be piereced by arrow or sword but a small simple flame could easily ignite the monster's hairy fur? It doesn’t matter how mighty the warrior may be, all bones go crunch, and all bodies can bleed. All it takes it’s a little bit of bad luck, and your time is up. Vitu does not intend to allow such a thing to happen. On a strange note however, while Vitu'i Ma is not adept in magic (as far as he knows), he has a surprisingly tough resistance to it, taking up more of an "Atronach" form than a freely magic-using caster. During one of his many skirmishes in the war, he came across an adept rogue magician that had disserted from the Lord's rankings. While the battle between Luscinia and the nameless spellcaster was short-lived, Luscinia, being young and a novice in combating magic users, was struck multiple times with electric and fire spells, before striking down the turncoat with a well placed arrow. It was only after the battle that Luscinia noticed the smoking holes in his vest. My favorite example of the magic system is the equal give/output, such as the Equivalent Exchange used in Fullmetal Alchemist. The idea of being able to create matter, only by using matter, is something that has always struck me as fair, and understanding, at least from a scientifical point of view. No offense to Harry Potter fans, but the idea of being born with magic blood, while sounding cool, is very much an easy bypass to explain how magic users gain the ability to perform spells. I'm surprised that no toddler in the Harry Potter universe has ever tried holding up a wand and saying a powerful spell like Avada Kedrava or whatever that spell is. And while the idea of imbuing magic into some item is a neat, it still doesn't explain HOW or WHO gave that item the power it originally has. If Vitu was granted the ability to perform magic, I feel like he should only be able to perform smaller spells. Useful ones for sure, ones that can help him on his many travels, but any spell that a master warlock can perform should definitely be out of Luscinia's reach. As for how, I cannot say... I do not know how magic works in the world. Luscinia would remember that he had read something about the basics of magic and how they can appear in different forms. In the case of this trinket, Luscinia would wear it (if it were small enough) around the neck, as close to his heart as possible, the center of where magic is formed. From this, he would attempt to recite magical spells, ranging from any type, just to see if anything would work. This took two hours to make lol.. So I'm sorry if it's a bit much. I like writing, and I get carried away at times! Being a ****, and by that I mean being a mary sue who tries to always put things in their corner of the court and basically forcing actions unto another plebian. Hunter is a large figure, even for an orc as he stands at 7'8". The mountain of silent muscle is notable for his dark grey skin with a blueish hue, this lending to his night time hunting. His muscles namely find themselves in his arms and back, with a good work in his legs. This is due to his tendency toward longbows and while he /is/ an orc and therefore mostly muscle anyway, these sections are where he shines. He's an archer, and contrary to what many believe, archers and strong. Especially when they're using longbows. One of the scariest things about Hunter is his quiet nature. Not only does the orc with the cut out tongue (he sometime grunts) not talk, he also as a hunter walks with a careful measured step, making him quite as he moves too. Now he's not as brash as many of his kind and he's not as much of a threat in a duel of the melee variety but he's known for his hunting. Hunter is very methodical in his works, he takes his time with things so he does them right. Everything hunter does he does with purpose and utility in mind, even if that purpose is forgetting your demons in a tankard. Born and raised in a tribe of orcs who preferred not to join in with the actions of a the pact, was an orc known as Krag. 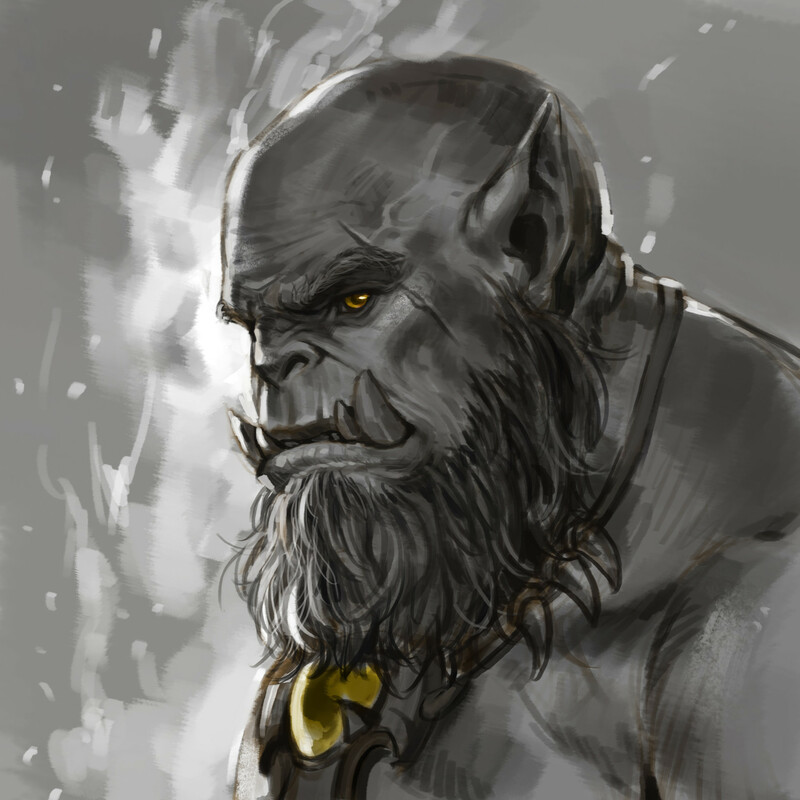 This orc child was raised a hunter by his clan, hunting what few beasts they could to survive. And for much of his young life this was all his life was. Now you must note that his tribe was not a large one, nor was it an advanced one. Hell, Krag never learned how to read or write orcish, let alone common. Now keeping this in mind, Krag's tribe was eventually forced, due to pressures of the war with the other races to join the pact. And as the orc was becoming a man as of this time, he joined the forces of battle and quickly showed himself adept with a longbow, as he had grown up using one. This massive orc fought against the other races for many of the years the war was wages but eventually those times ended. Much of his life was spent waging war and before that he hunted, so killing isn't something Krag enjoyed or hated. It just was to him and so he took up his hunting again, and along it did mercenary work when he could find it. Though after selling pelts he had gotten the orc found himself drinking and laughing with some of his orc friends in a bar in a small town. They'd never been in this town and instead just rolled through as their hunting took them outside their normal route. The orcs despite their usual drinking habits began to feel tipsy after just a drink or two and eventually they all were passed out in the bar. Little did they know their drinks had been laced and they would in a few hours find themselves chained up in an underground chamber with orc proof restraints. And when Krag's eyes opened they were wide with shock, one of his two friends was already run through, dead and the other was being tortured. He tried to call out but found himself unable to form words... then he realized the pain in his mouth. They had removed him tongue. Their kidnappers were two human men, one stepped out of the room though the other turned toward the sounds of Krag's grunts and smiled sadistically. "This is what you orcs get..." he said, though before taking another step forward he was sent sailing into Krag from behind. They were keeping his living friend on a chain leash of sorts like Krag himself and he had enough room to kick the man hard enough to do this. With this action Krag was able to get the keys from the man, who was knocked out on impact, maybe dead cause the kick hit the man in the spine. He unlocked his hands, then the collar from his neck. He then went over to free his friend just as the door opened again. The second kidnapper had returned but... well Krag crushed him quickly, he wasn't even strong by human standards. This happened some years ago, and Krag's friend died of his injuries. Along with this friend, Hark, so died the old Krag, as he could not communicate with more than a grunt or two (He still cant read or write in any language) he has taken on the name of 'Hunter' or anything else anyone calls him. He seems to not care to be called Krag anymore though. Hunter in more recent times has fallen into the same as he once did, Hunting. His prey being beast or even men if he's paid. Hunter grunts in annoyance but doesn't follow the child, he knows a massive orc chasing a child down the street will only cause him trouble. Instead he simply goes about his day, selling the meats and pelts he had gained from the day's hunt, then it's off to go look to see if theres any mercenary work for him. Finally in the night comes sleep, when he arises the cycle begins anew. Seeing the mother animal as doomed, in nature an injury like that is basically fatal, Hunter would put the animal down. He would not in fact put the pups down though as they were new to this world. Instead he would scoop them up and take them into town with him. He'd likely sell them to someone he deemed responsible enough. Though he might try for some days he would not find owners for them all and would instead end up raising them himself as hunting hounds. A good attempt for a start, but sadly one that requires a lot of work overall. For a start, your definition of meta-gaming is incorrect in this instance; meta-gaming is the in-character use of any information gained specifically out-of-character. Also, you do not give a definition to role-playing. Furthermore, your character's biography is severely lacking! Before the Pact War, there were not many instances in which High-Elves and Humans intermingled to birth the race, and as such I would need more information on Vitu'i Ma's birth and reasoning behind a naming scheme so uncommon between both races. Furthermore, it would be highly unlikely that Vitu'i Ma would not know of their heritage as a Half-Elf due to the differences between them and Humans. Due to racial tension, this would most definitely surface for him while living in Barkamsted. With him, this would be the case of long ears and black-colored eyes. On that note, however, I would like to see more information regarding how the Pact War had affected him and his family, let alone his farmhome. In general, I need to see more information regarding the Pact War and its impact on the bigger picture of his life rather than his arm alone. Your magic application, also, is extremely lacking! Key issues include the lack of any actual 'enchantment books,' no such thing as quarter-elven blood, no words or actions needed for casting, and no resistance to magic. Please specify what you mean by "Atronach" style casting! All in all, it looks as if the rules and ideas behind casting magic on the server were not fully understood. With this said, magic description and magic limitations are bundled together when they should not be. Those two parts of the magic application should be separate, and written separately. You yourself state that you don't understand how magic works in Saphriel! Please refer to older applications if you have difficulty with what is stated on the forums regarding magic. As a side note, Saphriel's magic does not involve any form of equivalent exchange beyond the use of magical endurance. Nothing must be exchanged for a holy mage to form a shield beyond a bit of exhaustion to their endurance, for instance. And lastly, the magic scenario example is severely lacking. Magic is not recited by words, and trinkets are specified to their aspects! It seems more like a general attempt at responding to a scenario than an example of how a character would cast magic. Should these issues be addressed, please poke me and another review will follow! Generally a well-made app! However, I will need to ask for a few edits and adjustments. For a start, I'd like to see improvement on the definition of power-gaming, as your current one seems very subjective and without a clear statement. Power-gaming is generally seen on this server as forcing actions or emotes upon another character, for reference! Also, please add more detail and information to your character's personality and appearance sections! They are lacking, currently. As a final note, your character's name seems to be a bit vague, going from 'Mute' to 'Hunter' to 'Krag.' Please note his birthname, or name he generally goes by, where it is requested! Should edits be made, please poke me and another review will follow. Yeah I’m not waiting another week. This application is now Accepted. Much, and thank you for your edits! Everything looks to be good to go now after a quick review of edits done, welcome to Saphriel!